Deep River, Conn.–Badly in need of a time-out, I’m back from a long weekend at the Salvation Army Conference Center in Sharon, Mass.—from 11 a.m. Friday to 10 a.m. Monday. It was terrific, as I expected. I had been there 25 years earlier. The weather was perfect that time, and so was the program. Why the time-out now? It’s been a tough year. After two months-long try-outs in Morro Bay, Calif., near my daughter Monique’s, I felt I should be realistic –at the behest of her and my sons Arthur and Mark—and make a permanent move there. It made sense—I’m in my 88th year. And that meant returning home, disposing of all possessions (no room in my manufactured home in Morro Bay) and selling my nice townhouse in Piano Works Condominiums here. I’ve lived at Piano Works for some 20 years. Our leaders from start to finish and morn till night, Majors Ed and Flo Forster. My timetable meant wrapping all this up and returning to California after Thanksgiving, before winter storms in. So lots of hard work involved, compounded by strongly mixed emotions. Deep River has been my home in the truest sense. I’ve been a part of the community, have fine friends here, love the area for its beauty and easy access to its full range of everyday businesses and services. I had a well-thought-out timetable for moving but of course things have popped up that required adjustments. That’s life. But I was steaming along quite well. I had planned a visit up to Massachusetts for a few days. The Worcester area was my home for close to 40 years. 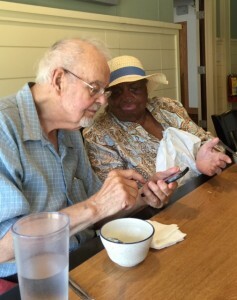 I wanted a final visit with dear friends. I also planned a respite at the Salvation Army Conference Center to catch my breath, plain and simple. Then a spoke in my wheels. I live alone, of course. On Saturday morning, after a strange and restless night I got out of bed—and nearly fell. My body balance was way off. I made it across the room by reaching out and resting my right hand on a chair, my left on a dresser, and so on. Sure, I had noticed a decline. That goes with getting old. But this was awful. I thought the crisis would pass. Spent several hours in bed. Feeling better and thinking getting out into the fresh air would help me, I drove to the public library in Old Saybrook, a favorite haunt. I felt better driving. Parking by the library door, I got out, and nearly fell again. Bottom line—an ambulance to the Middlesex Clinic in next-door Westbrook, tests, a second ambulance to the hospital in Middletown, three days of more tests and care. The diagnosis: a transient ischemic attack—a TIA—a small stroke. Stroke—that’s a very scary word, however small. Good care and finally transfer to Aaron Manor Rehab in Chester, just up the road. Five days of good care, including occupational and physical therapy. View from my bedroom. The center was beautifully poised on a bluff overlooking the lake. Then discharge home, with follow-up appointments with my doctor and a neurologist and a cardiologist. These are upcoming. I felt pretty good, determined to carry out with my now imperiled timetable. What was wonderful was that I felt no deficit from the TIA, no loss of any kind. So heartening. Now my visit to the Conference Center and afterward my friends became super important and I got everything scheduled. I said I had been to the Conference Center before. It had been so pleasant that I’d never forgotten it. Some background. 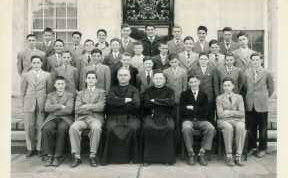 When I was 10, my parents sent me off to a Catholic boys’ boarding school there in Sharon. 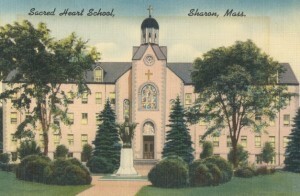 Sacred Heart Academy was operated by the Brothers of the Sacred Heart, a religious order. I went there for the 5th, 6th, 7th, and 8th grades. It was hard. I returned home only for Thanksgiving, Christmas, Easter, and the summer, but in the summer I’d get sent back for summer camp. My father and mother did it because they felt it would be good for me. The homesickness finally passed and I adjusted and did well and I’ve never regretted the discipline and the solid education I got. The school was on the south shore of Lake Massapaug, a big and beautiful lake. I learned to swim in Lake Massapaug. Rob and Darlene Malenich, the directors. They did everything, from running the place to working in the kitchen. Some 25 years ago I learned about the Salvation Army Conference Center. It was on the north shore. 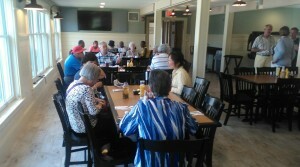 It offered a variety of programs, including a week for seniors. Open to anybody. The only distinctive Salvation Army activity would be an evening chapel service, and that would be optional. The week would include my room, meals, recreational and leisure activities, free time, and use of its beach on the lake. A full and fine package. I don’t remember the price but it was attractive. I signed up. A big factor was getting a look at Sacred Heart Academy—my first time back–and enjoying Sharon and its pretty environs. I did all that. 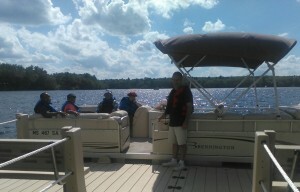 In fact, I even brought my little Sunfish, sailing on beautiful Massapaug every afternoon. One big surprise: we were about a hundred guests, but more than half were Russian-speaking immigrants from the Boston area! From the disintegrating USSR! They had heard of the Conference Center as a good deal and were flocking to it. The language barrier was enormous for them and us, but they were friendly and I enjoyed being in their company. Little did I realize that one day Peace Corps would send me to Ukraine—a major republic of the USSR—and I would be tasked with studying Russian. 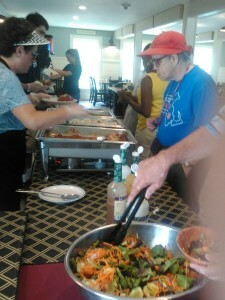 I saw how the Center hosted a variety of groups, including some not related to the Salvation Army. I understood why such groups would enjoy themselves there. I knew very little about the SA. Only that they operated their famous bell-ringing kettle program every Christmas, operated lots of stores filled with second-hand clothes and stuff, and had a good reputation for helping people in need of any background and showing up to lend a hand in emergencies and disasters—floods, fires, whatever. Good meals, all-around friendliness. I felt right at home from the start. 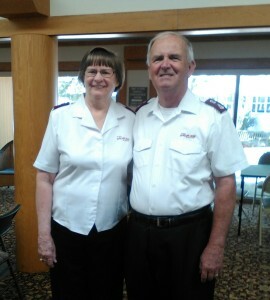 There were just a couple of Salvation Army officers involved in the Sharon program and one presided at the evening chapel service. I attended out of curiosity and am pleased to say that I enjoyed the heart-warming singing, the “we’re all in this together theme,” and the presiding officer’s uplifting plain talk, based on Scripture. Who was not in uniform, by the way. I was fascinated by the Salvation Army. I knew it was founded by William Booth in the 1860’s in London. He was a Methodist minister. He saw that a lot of people never went to church because they didn’t fit in—were too poor, had little education, lived in bad neighborhoods, were smelly, and so on. He started a ministry in the poorest neighborhood and he “clicked.” His wife Catherine pitched right in him. That became the Salvation Army, now carrying on in many countries around the world. Its mission in just a few words is to lead people to salvation all while carrying on good works to all in need. Yes, it was an “army,” committed to the hope of Christianity and sworn to wage battle against the forces of evil. Its ministers would be trained in its schools, then would be ordained and commissioned. They would don a uniform and start out as lieutenants, working up to captains, majors, even higher, right up to the top general. With my four new friends. We were together for all meals. Lucky me. It was an equal-opportunity employer from early on, long before that expression was known, welcoming women as ministers and officers and giving them access to opportunities in the many services it provides. In fact, male officers and female officers were encouraged to marry and carry on their work as a team. They still are. Officers swear off alcohol, smoking, drugs, gambling. As well-known as the Salvation Army is, it is surprising, well to me anyway, how few officers it has, relatively speaking: in our whole 50 States, 3,500 active and 2,000 retired (with some in post-retirement service, such as Majors Ed and Flo Forster; you’ll be reading about them in a minute). The Army is in 127 countries, with nearly 27,000 officers worldwide. There are more than a million soldiers (church members), 170,000 adherents (additional regular church attenders) and countless numbers of program participants, friends and supporters. It employs many thousands of civilians to help run its numerous programs. “Eat till you’re full” and it was good, so we were happy campers. Even me the vegetarian. I found this the case at the Conference Center. The two top administrators were Robert and Darlene Malenich, a husband-and-wife team there for 20 years. Hired civilians.There were two officers involved, man and wife, but only for our weekend. If you’d like to learn more about the Salvation Army, I encourage you to go online to its websites or through Google and such. I think you’ll find it very interesting and will be greatly impressed. Yes, I had heard that my Sacred Heart Academy had closed. But I was shocked to see that its impressive building had been razed and the grounds were now a large Sharon public park and athletic field. It was all gone. For this, my second visit in so many years, I drove the 127 miles to the center in jig time and arrived 15 minutes before the 11 a.m. start time. Only two cars in the lot! Nobody around. Had I come on the wrong day?! I drove around, finally spotted a solitary worker outdoors who told me all was fine and accompanied me inside. There I found the other guests. No cars out there because all those guests had been driven here, and at the end would be driven away. We were a surprisingly small group. Only 19. Numerous others had canceled, for this reason and that one, I learned, in some cases forfeiting their deposits. Lunch was at 12:30 in the large dining room for a hundred, but we were all at just four tables at one end. I was assigned to table 1, and my table mates, it turned out, were four black ladies, seniors, of course, but I was the most senior. In fact I suspect I was the oldest of all of us. The room had gorgeous views of the lake, and it was so pleasant to gather there. Every meal turned out to be a nice experience with good and generous food, good service, and real conviviality. I had great chats with Barbara. I got a better perspective about lots of things. The five of us ate together right to our ninth and last meal, and I liked and enjoyed them all, Barbara and Ella and Rebecca and Zephyr (I think). They were all from the Dorchester area of Boston, and went to the same senior center. We never got into it, but it was plain that they had had difficult lives, which was no surprise. They were here because they had won a drawing for tickets–and they reveled in being here free. Who wouldn’t? Full disclosure: I had paid the standard price, which was $180. Yes, for the full, fine weekend. How about that? Later I learned the Army had received a legacy, which had funded their attendance with us. There were four tables of us. 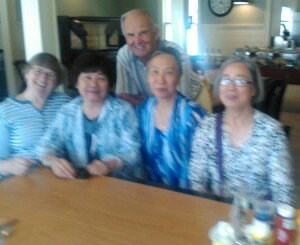 At the fourth table, far over, were five Chinese ladies, four elderly and one about 35. I went and said hello. I’ve been to China four times. My Chinese (Mandarin) is zero. They couldn’t understand a word of mine. They smiled at me and I smiled at them. All four were recent immigrants. The fifth, the young one, had been here for 23 years and spoke fluent English. She had heard of this opportunity for seniors, had encouraged them to attend and had come along to shepherd and translate. Yes, they smiled a lot and I like that. I thought them wonderful. They participated with others in card games and group jigsaw puzzles and other activities that required little talk. I felt badly they couldn’t plunge in fully. Our man-and-wife officers, yes, Major Ed Forster and Major Flo Forster, often dined with them and the five took to them, as we all did. In fact, they took part in everything. Tables 2 and 3 were made up of whites mostly, young seniors and older ones, couples and singles, and again nearly all from the Boston area. We all got to be friendly. We had a relaxed but full schedule, keeping us interested from 7 a.m. till 11 p.m. Majors Ed and Flo were on deck all the time, from early morning (leading a walk at 7:30) to lights out at 11. Our two majors with three of our Chinese ladies. No English– their smiles said a lot. talent show on the other–then movie time at 9. There was no compulsion. We could attend or do something else. Highlights were a motor tour of the extensive children’s camp next door, the SA Camp Wonderland—many kids of many backgrounds at many activities–and rides around the lake with Rob Malenich at the wheel of the pontoon boat. This was my first close experience with Salvation Army officers, and if they are all like Ed and Flo, they are an impressive bunch. They had been officers and man and wife for 49 years. Now they were retired, with a home in Pittsburgh close to a son and his family, and a summer home in Old Orchard Beach, Maine. But they had come here to Sharon to lead our group, and would return to lead another in September. Throughout the day they were not only leading us in activities, but often actively participating. I got to admire them greatly. By definition they were leaders, looked up to as such, but never intimidating with any airs. Always pleasant and friendly. Were just Ed and Flo to us, never Major Ed and Major Flo, and wore their SA uniforms only for chapel services. At other times they could have passed as us. 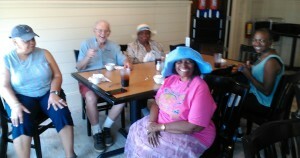 Flo was sweet and kind and assured, and presided at every meal. Ed was our director, leading us easily through the program and making us chuckle with one joke after another. He could have made it on TV as a comic. Time and again I saw them joining guests in a puzzle or a board game or teaching indoor bocce on a carpeted corridor. In fact, getting guests to do those things. The ride on the lake was a big hit. They had both worked in the full, broad range of SA activities and responsibilities, but Ed had worked up into a particularly interesting specialty, at least to my eye. He had grown up liking to write (he told me that as an officer he had published four books), and had gotten into the SA’s publishing activities. In fact had become editor-in-chief of all its publications, which are published not only here but in different languages in different parts of the world. I got to see several copies of SA magazines, and I found them interesting, significant, eye-catching, totally professional. As part of this, he and Flo had been posted in London for three years. That’s the “Vatican” for the Salvation Army. And had worked in several provinces of Canada for another three years or so. I loved the activities, well, most of them. I excused myself for three hours on Saturday and Sunday afternoons to drive around and check the area. I circled the whole lake and found it still free of commercial development. Which is quite rare. I spent a lot of time at the site of my old school. Not a hint of it remained. Gone was the oval track that we biked around during recess. Gone was our big apple orchard—every afternoon at 3:30 p.m. we got an apple (or a home-made donut) for a snack, and fresh apple pie every other supper. Gone were the two tennis courts but replaced by two in a different corner. Gone was the half-acre pond behind our school. The footprint of the school building was now a “dog park.” I even found the foot path, faint now, through the woods that took us to our beach at the lake. 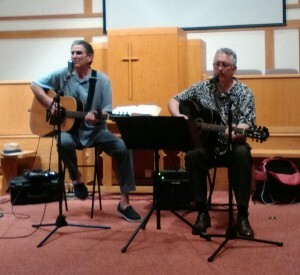 We enjoyed hired musical talent not just one evening but three. Quite good . Our big playing fields directly across the street were now Sharon’s recreational athletic fields–for baseball and football and soccer and such. I saw no plaque, no sign, no clue that this fine school had turned out class after class of boys for many years. Oh, I did get to look at a spot off campus where I had spent many good times. It was three quarters of a mile away, across the highway, a big gravel pit dug into a hollow in the forest, the pit long abandoned. On nice Saturday afternoons, we’d parade there, led by a proctor, and turned free to play cowboys and Indians and hide and seek, prowl the woods, have fun and get a break from the strict routine of our daily life. There was no gravel pit now. The whole area was a neat and attractive homes, with broad streets and street lights. I’ll bet those folks knew nothing about what I just talked about. And I got a good look at Sharon the town. One thing hasn’t changed. Right on the main railroad line connecting Boston and New York, it is still home to countless commuters working in Boston. The town, quiet, peaceful, pleasant, middle-class comfortable, with tidy streets, plentiful trees, and the gorgeous lake, has become a very desirable address. 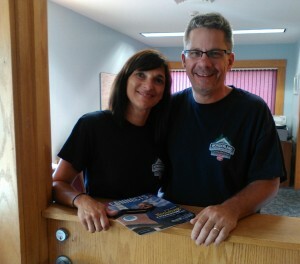 I even got to the Sharon Historical Society and found three volunteers at work in its fine old building. I asked question after question about my school, and learned so much. One lady even went online and found pictures of it! I had never thought of doing that. This was my school. Impressive, don’t you think? Gone! Razed! Hard to believe. This drive-around had been important to me, and I returned to the conference center pleased. On Monday morning after a relaxed breakfast, with nice remarks by Majors Ed and Flo, we all checked out. As requested, we had stripped our beds and tidied up our rooms a bit. We had arrived as strangers. Now we were departing as friends. Lots of good wishes, even some hugs, with Major Ed and Major Flo and other staff matching us with smiles and handshakes and pats on the back right to the final minute. I had had a great time and looking around I saw the others did, too. In minutes I was on I-95 South. It hadn’t even been a dream in those schoolboy days of mine. Surprisingly Sharon had changed little. Why my old school closed, I still really don’t know. I didn’t rush home. I followed through with the visits to friends that I had long anticipated. I got to see every one of them and I found them all doing well. I considered that extraordinary. I had expected some disappointments and sad moments. I didn’t run into that at all. Every class posed for a graduation photo. We really got dressed up. Mine graduated some 10 years earlier. I had come needing a time-out and a catch-up. I returned home to Deep River wonderfully pleased. And thankful. I will carry the memories of it all right to California with me. P.S. 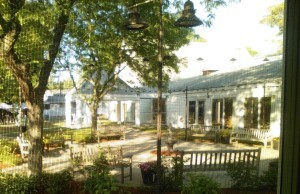 If you’d like a nice time-out, consider the Salvation Army Conference Center in Sharon, Mass., right on Lake Massapaug.